On March 13 I posted the first of three interviews with farming couples who agreed to openly share the stories of their agricultural adventures, how they came to a common vision, the unforeseen of farming together and advice for partners considering starting a farm. Today’s interview, third in the series, is with Red Truck Farm in Ridgefield, Washington. Red Truck Farm is a 1 and 1/2–acre specialty vegetable farm located in Ridgefield, Washington, just 15 miles North of Portland. We follow organic practices and are committed to growing high quality produce for our community. Our land totals just over 7 acres with a little less than half in forest and forested floodplain, backing up to Gee Creek. The rest of the property has our home, one barn, one greenhouse, and about 3.5 acres of arable land. We began the farm in 2006 after a number of years of growing on a smaller scale, and working and learning from other farmers in the area. 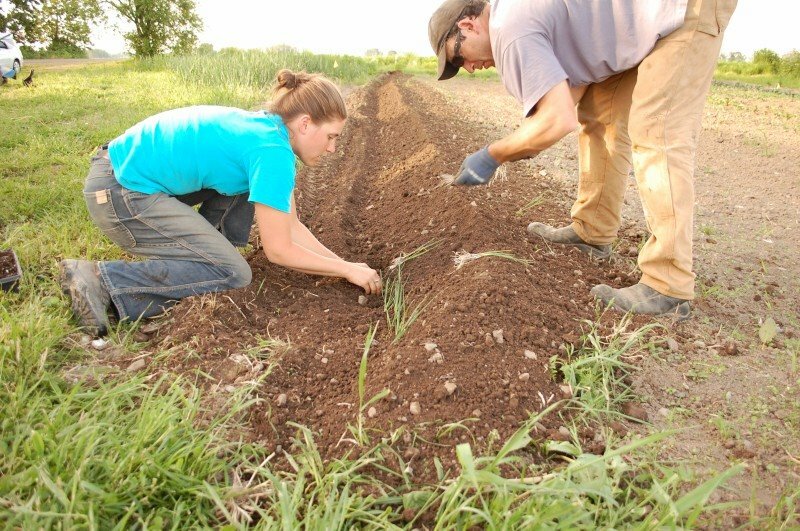 We started out together as apprentices at Sauvie Island Organics where we began with a small bed of experimental varieties that we were excited to try out. We now grow produce for the New Seasons Market, and other local restaurants and cafés. We met during our apprenticeship on an organic farm in Portland. The best advice we’ve been given is to focus on those things that we each do well and don’t try to do what comes natural to the other person. If there are still gaps remaining, focus on them together to share the burden of what doesn’t come naturally. Nothing is exclusively one person’s or the other. Jason works part-time during the peak of the season and the off-farm job allows him to go down seasonally. He carries the majority of the harvesting, packing, cultivating, and marketing. Amber works full-time year ’round and contributes to packing out, invoicing, record-keeping, taxes, and harvesting. More equally shared are farm projects (greenhouse building, high-tunnels, fence building, greenhouse planting, annual farm planning and seed ordering). We are continually refining what products work well for our current schedule and what might allow for one of us to be full time on the farm permanently. This involves looking at our sales records, deciding on which market avenues to pursue, and taking inventory of what we really enjoy growing and selling. Shared success, be it with new customers, a completed project, or just deciding when to stop for the day each has its own rewards. It is a lifestyle, and a commitment to doing it exclusively your way. You choose how your systems and approaches fit your standard of living and can make a very clear connection as to how you choose to farm to influence how you live your life. Deciding on the right systems and approaches in an ever-changing world, most of which is completely out of your control, and committing to how you want to live your life. Owning our own land sooner than we thought. Given how we’ve structured our life, it made sense to buy sooner than later, but it’s still sinking in. Make your relationship as much of a priority and goal for success, as much as you make the success of your farm a goal. Dedicate time away from the farm in the crazy season to allow yourself a break and gather perspective. Dedicate that same amount, at a minimum, in the not so crazy time of year to rejuvenate. Don’t be afraid to discuss the farm whenever it’s on your mind, just don’t get mad when it’s not on your partners mind.